Hello and thank you for choosing to read about our holiday home. 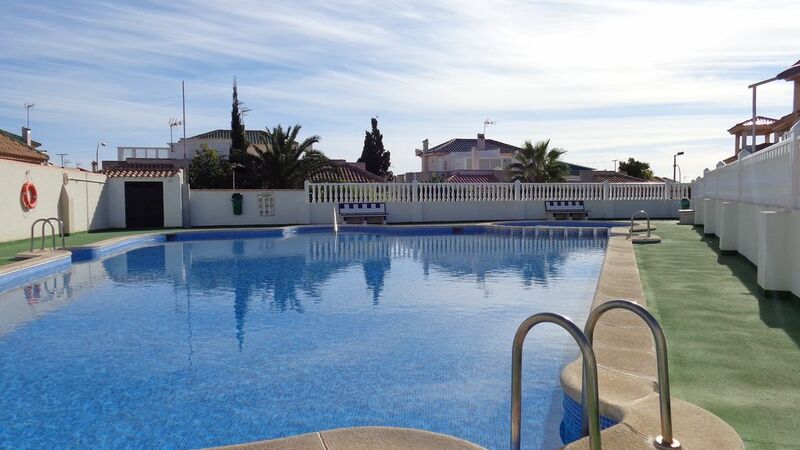 Set amongst the wonderful views of Los Altos ('The Heights' in English), Our home has plenty to offer - whether you're stopping over for a short winter break or a two week summer holiday for you and the kids, 'Casa de Gienia' can fulfill your needs! We've recently taken it upon ourselves to update and refurbish nearly the whole place including a luxurious new bathroom, modern high quality kitchen, and completely new furnishings throughout. This makes for easy supervision of the kids, and even for great picturesque views (Check out the roof pictures). In our opinion, our home is perfectly suited for Small Families and Couples. The surrounding area has plenty going on and yet our actual Urbanisation is very tranquil - NEVER any loud noises from pubs or bars, and yet there are plenty only a 5, 10 or 20 min walk away. If you'd like something a little more in the clubbing region Torrevieja town is only a couple of kilometres away, easily accessable by the letter 'D' bus (Which stops just round the corner) or by taxi for a few euros. Waterparks, go karting, 5 aside football pitches and indeed actual recreational parks with children's play areas are all close by. Our nearest supermarket is Consum, at around a brisk 6 minute walk away offers up plenty if you fancy those relaxing home-cooked meal nights at home, and is very reasonably priced. There's just so much going on and I'm unable to list everything on here without going overboard so I'll be bullet pointing the rest. If you'd like to know anything else in the mean time, please don't hesitate to ask. Grew up in London, fell in love with Spain around the age of 10 and haven't look back! The area is totally residential meaning no horrible concrete hotels scattered. A real home away from home. Unfortunately access to the front door is up a few steps making it inaccessible to wheelchairs. We have recently returned from 2 weeks staying in this property, and what a wonderful little property it is. It was very clean on our arrival. The home had everything you would need to make your holiday really pleasurable. It was lovely sitting outside the front door in the mornings for breakfast overlooking the lovely pool. The upstairs solarium is a real suntrap for all sun worshippers. A large parasol was provided for guests who require some shade. It was so hot during our holiday that this got a lot of use. It was lovely sitting here at 7.30am in the morning and watching the sun rise. We also watched an electrical storm one evening from here which was amazing to see. The shower was great as you could choose either waterfall shower or a normal. The shower was over the bath so you also had the option of using the bath. This was great for getting rid of all suntan lotion used during the day. The steps up to the roof terrace were quite steep and care had to be taken when carrying items up and down. A very small kitchen, but we had no problems with this as it is well equipped with everything that would be needed whilst on holiday. A lovely pool right opposite the property was fab. We were able to sunbathe on the roof terrace and when the pool area had gone quiet, we could look down to see an ideal time for us to pop over. We managed this several times and were able to have the pool area to ourselves. It does however get quite busy at certain times of the day, usually mid-late morning and late afternoon and into early evening. If you don't mind walking, then a car is not required as everything is within walking distance if you are happy to walk for half hour. We found a couple of lovely bars within 5 minutes. 20 minutes uphill were some great English bars and 25 minutes down the hill were many more bars with the beach slightly further than this. When we had any questions we wanted answering we emailed the owner and he responded almost immediately and usually within the hour. The local bus into Torrevieja is well worth using with the bus stop almost outside the property and costing 1 Euro 35 per adult each way. We used the bus in and got a taxi home which was not expensive. Zenia Boulevard is well worth a visit .. very impressive! We had an amazing holiday and are so glad that we chose this property as it was ideal for what we wanted. A relaxing 2 weeks in the sun in a very tranquil setting. Great place to stay - definitely staying again! Villa is lovely has everything you need. Villa very clean has everything you need pool a bonus right out side the door bus stop and the end of the path which was very useful villa park 3 complex just at top of road with bars and restaurants reasonably priced also consum supermarket just round the corner beach about 30 min walk away but the bus takes you down there,Tom the owner very helpful sends email straight back to you with anything you need to know also provided us with a gentleman called Peter to pick us up and take us back to airport who was also very helpful would definitely book again and would recommend his villa thanks Tom for a lovely holiday .